Out of the hundred or so cookbooks I purchased this summer [okay, maybe just 11], I'd have to say one of my favorites is Anthony Bourdain's Les Halles. I mean, I'm already madly in love with Tony's dry, sardonic wit, and to see that so eloquently translated in a cookbook was a match made in heaven. It's not one that I've actually used for recipes yet [I'm not exactly a connoisseur of bistro-style cooking, let alone have hours upon hours to make my own demi-glace], but it's one that I enjoy reading as though it were a novel. Which, you may know by now, is a quality I think is essential in a good cookbook. Not just recipes, but vignettes. Not just photographs, but memories of places and emotions felt there. Not just cooking tips, but life advice. And in Les Halles, Tony is brilliant. Anyway, the point is, one of my favorite things Tony says is that his book is not going to teach you how to cook. Well, then, what's the point of buying a cookbook, right? Well, "to teach you how to love food." ...Or at least, something to that effect, with a little less fluff and a little more cursing thrown in. So I've been trying to look at recipes as more guidelines than actual rules, giving me an idea of proper ratios for flours and baking powders, spices and vegetable stocks, and kind of letting my mind run wild with ideas. Yesterday when Tommy popped by to help with the basbousa, we decided to do some baking for today's Sunday brunch, and settled on one of my favorite treats in the entire world. 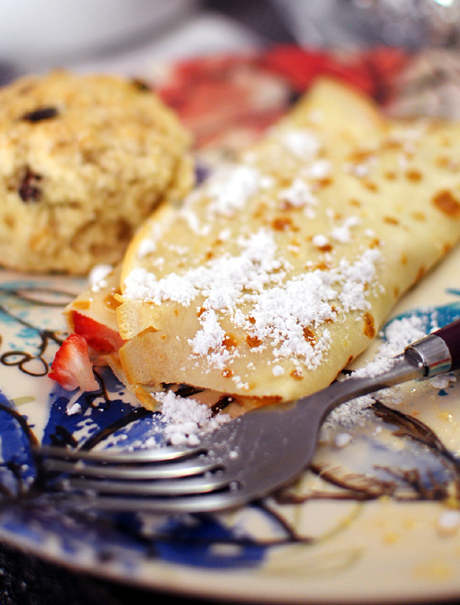 Although, crepes filled with butter and sliced strawberries and topped with powdered sugar are a damn-close second. Scones, of course. 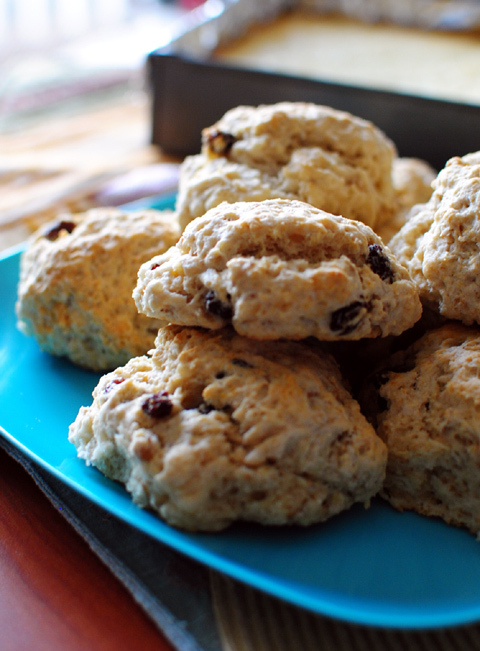 Oatmeal-raisin scones, this time. The base recipe comes from Breakfast, Lunch, Tea, but has been adjusted to suit my own tastes. The end result was something hearty, not-too-sweet, with a consistency in between that of a scone and a biscuit. Perfect with a slather of butter and a drizzle of honey. And of course, some good company. Preheat oven to 400 degrees Fahrenheit and line a baking sheet with parchment paper. In a large bowl, combine flour, oats, baking powder, sugar, and salt until well-mixed. Cut in butter until incorporated [you can use your hands here]. In a separate bowl, combine cream, vanilla, and lemon juice. Make a well in the middle of the dough and pour in the about two-thirds of the cream mixture. Using your hands, mix the flour and cream mixture until the batter comes together. It shouldn't be sticky; if too wet, add more flour; if too dry, add more liquid [you may not use all the liquid, which is fine]. Finally, add in raisins and give a quick mix with your hands. Form discs of dough and spread them out across the baking sheet. 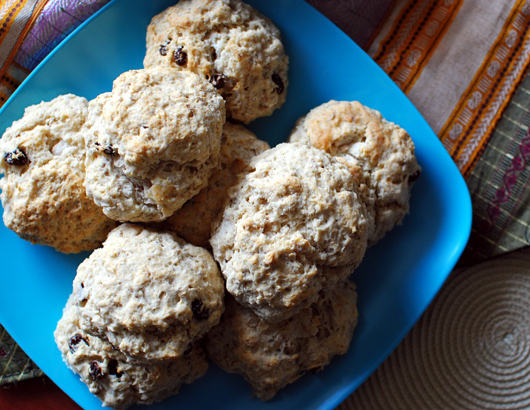 Bake for 15-20 minutes until the tops of the scones are light golden-brown. Let cool at 10-15 minutes before serving. 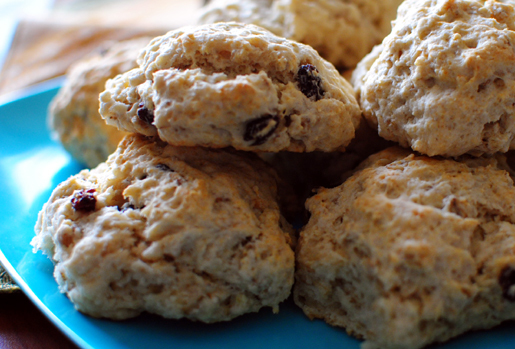 Scones are best served warm, but can be kept airtight at room temperature for up to a day. Serve with butter, jam, honey, or clotted cream, as they are not very sweet. What can I say? My friends know how to eat. about on the net. You aсtually realize hоw to brіng an issue to lіght and make іt important. and understand this side of your story. I was surрrіsed that yоu're not more popular because you most certainly have the gift. I think the admin оf thіѕ wеb page is truly workіng hard in favor of his web site, sinсe here еѵery infoгmation is quality based ѕtuff.